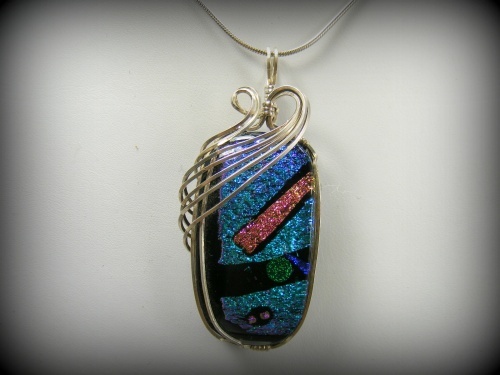 This gorgeous handmade fused dichroic glass piece is so showy and so stylish with the blend of colors that will match almost any outfit. Colors of blues, pinks greens and some black make it so interesting. Sculpted with a modern look of sculpted sterling silver swirls. Piece measures 2 1/4" by 1" wide and comes with a sterling silver snake chain.